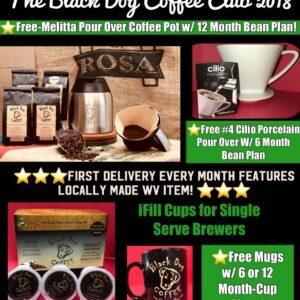 Never leave home without your Black Dog Coffee! Enjoy a fresh cup anywhere with this single serve, gold-filtered brewer that fits perfectly into our stainless steel travel mug with easy to clean flip top spout. Comes with a half pound bag of freshly roasted and ground Black Dog Coffee for a fresh cup on demand. Copyright © 2016-2018 Black Dog Coffee, Inc.